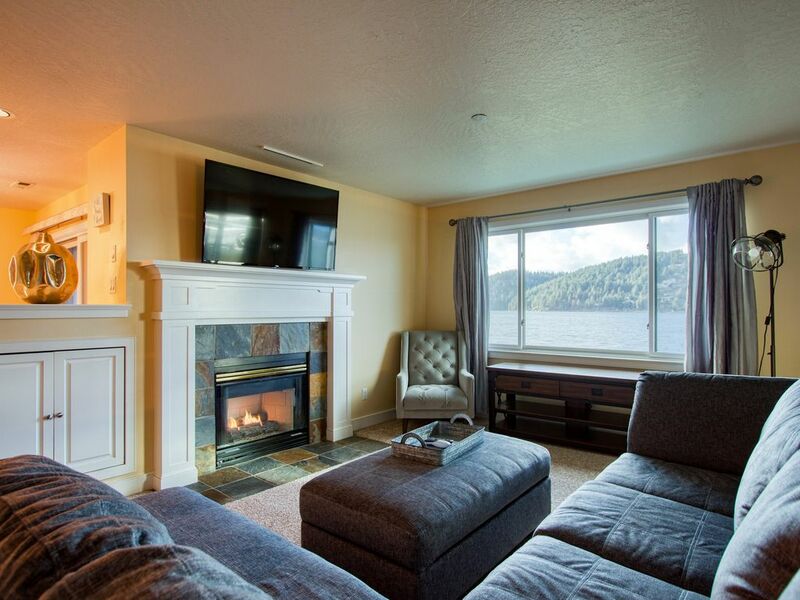 This lakefront condo is the perfect summer retreat with resort amenities, a refreshing community pool, and a private balcony along the banks of Lake Coeur d'Alene. Whether planning an intimate family vacation or romantic getaway, the stylish condo offers something for everyone! All furnishings (beds/mattresses/TVs and amenities) are updated and brand new. The unit is located in Arrow Point condominiums, a family-friendly environment only 20 miles from Harrison, with an indoor pool! Enjoy spectacular views while socializing in the cozy living room with a fireplace, preparing a meal in the fully equipped kitchen, or sitting at the dining table for six. In-house media entertainment includes a cable TV. Featuring two bedrooms and two full baths, the condo lodges up to 10 guests (four adults). Bed options include a king bed, six twin beds, and a sleeper sofa. Extra amenities including a garage and private washer/dryer will keep guests comfortable for lengthy stays. Fire up the grill on the balcony and serve a sunset feast on the bistro table! Arrow Point offers luxury amenities when the weather is cloudy including an indoor pool. Harrison is an outdoor haven offering equipment rentals and guides for sports as varied as mountain biking, stand-up paddleboarding, and parasailing. Launch your boat just eight miles away and make waves into Coeur d'Alene for afternoons spent shopping, dining, and exploring the resort community. Seasonal attractions like Silverwood Theme Park and Silver Mountain Resort are all within 35-miles! You simply can't get a better location! Plan your next sun-kissed vacation along the lake today! Parking Notes: Your assigned garage space is marked F-104. Should you have more than one car, the second car must be parked outside the building in the open parking lot facing the volleyball court/pool house. Boat parking is available from Discovery Marina for $35 per day on "C" Dock. *This Condo owner would greatly appreciate it, if you did not wear shoes in the Condo Unit and left them just inside the door please. Very clean, new and comfortable. Great view! We had a great time exploring the area and meeting some of the locals. We visited several coffee shops and breweries. The weather was a bit cold but it didn't matter since we had a nice fire in the fireplace waiting for us. Loved the location, views can't be beat. The home was fully equipped and very clean. Only concern was the 2nd Bdrm-had two 3-stack bunk beds (6 beds) in a small room, tight squeeze and claustrophobic. Be sure to grocery shop before you get there as it is a distance from a grocery store, we prepared in advance and had no problems. The location is beautiful. Rental is tidy. The previous reviews about linens and mattresses being in need of replacement is true. There could be more supplies in the kitchen. There could be update TVs. But still, this place has a great view, quiet location, and is neat and tidy. We enjoyed it! Overall we were dissspointed with price to quality of this place. It seems owners haven’t invested time or money in their condo / rental property.